God decided long ago to receive and save all who come to Him. Now it is up to you. This matter will have been decided as soon as you have made your decision. “And after some days, when Felix came with his wife Drusilla, who was Jewish, he sent for Paul and heard him concerning the faith in Christ. Now as he reasoned about righteousness, self-control, and the judgment to come, Felix was afraid and answered, ‘Go away for now; when I have a convenient time I will call for you.’” Acts 24:24-25. Presumably, he never had a “convenient time.” Take this as a serious admonition. One thing is needed! Decide at once. “Then Agrippa said to Paul, ‘You almost persuade me to become a Christian.’ And Paul said, ‘I would to God that not only you, but also all who hear me today, might become both almost and altogether such as I am, except for these chains.’” Acts 26:28-29. I would like to say the same thing: Oh, that you who hear me (read this) might be as I am—that it might go so thoroughly well with you! The decision is entirely yours, dear soul. God is calling you. He is inviting you. He is pleading with you. Will you or will you not? The decision is yours. “But when he came to himself, he said … ‘I will arise and go to my father …’” Luke 15:17-18. This is quite significant. When you live in the usual, worldlyThe term “worldly” is used to describe anything that is purposed towards the world’s goals/ideals/pursuits as opposed to that which is of the Spirit. (1 John 2:15-17; Titus 2:11-12)... More way, as a sinner among sinners, you are not in your right mind, really; you are not yourself. When you think about it, you will discover that you really do not want to live like this. You have been drawn along with the others; you have followed the crowd. You ended up like this without thinking much about it. You went arm in arm with your friends and companions, who simply carried you along. By reflecting on it, you will say just like the prodigal son, “Why should I live like this? I do not need to live this bad life!” Of course not! Why should you be unhappy, without peace, without hope, feeling judged in your conscience and leave God behind? He would be very glad to receive you! Get up, and go to Him! Then this word will be fulfilled: “It was right that we should make merry and be glad, for your brother was dead and is alive again, and was lost and is found.” Luke 15:32. The reward of sinSin is anything that goes against God’s will and His laws. To commit sin is to transgress or disobey these laws. The lust to sin dwells in human nature. In other words, it is contaminated and motivated by the sinful tendencies that dwell in all people as a result of the fall into sin and disobedience in the garden of Eden. This... More, or its punishment, is death. It is sin that causes separation between God and us. Jesus came to take away our sins and make an end of them. “If we confess our sins, He is faithful and just to forgive us our sins and to cleanse us from all unrighteousness.” 1 John 1:9. When you confess your sins, you will be cleansed. Then you will become a Christian. Then you have made a beginning. Then all your sins have been wiped out in a single moment, even though they may have been ever so many! The simplest word in all the Scriptures is this: “Whoever calls upon the name of the Lord shall be saved.” Romans 10:13. The fact that you call on His name is evidence that you believe in Him. Jesus says, “He who prays receives.” And James says, “You do not have because you do not ask.” It is quite simple to be saved. There is no need for a ceremony. The order of your words does not matter at all. For that matter you could just as well say it in the wrong way, or backwards. God understands you quite well. For example, you might say, “Take me as I am,” or something similar. We will receive everything we pray for according to His will. His will is, first of all, that all our sins are wiped out; and secondly, that we receive power to overcome sin. You become a Christian by getting a new heart, and you receive this heart by praying for it. Then He will also give it to you. Read the Bible! Do not be embarrassed to read the world’s richest and best book! What is written in this book is capable of transforming you completely and entirely. What is written in this book is the truth. The words in this book are not only letters, but there is spirit and life in them. Take God at His Word! 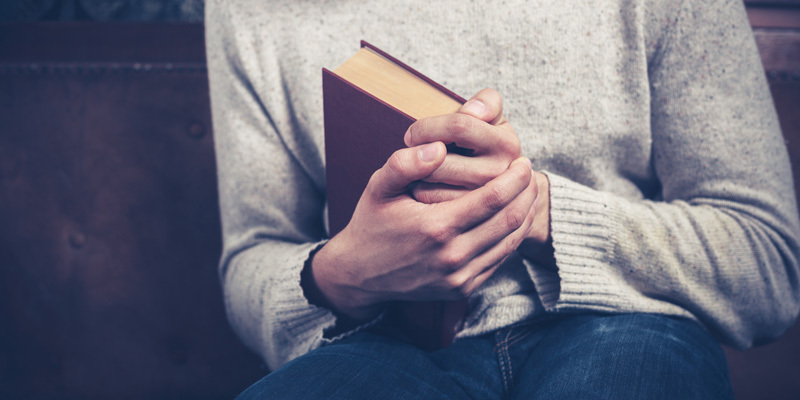 Hold fast to what the words say, and you will become a Christian in spirit and in truth. The seeds that fell on the good ground are those who, having heard [or read] the Word, kept it. (Luke 8:15) Keeping it is the same as believing it. The Scriptures are full of such words that contain exactly what you need, what you long for, what will give you joy and will benefit you. Just read them, and you will soon regret that you did not begin to read this amazing book earlier. The Book of Books! It is an inexhaustible fountain! Just don’t misunderstand it as so many have done. You are not doing God a service by reading it. There is no virtue in reading it for the sake of just reading it. You need to read it for your own sake. The important thing is that you lay hold of what you need, that you hold on to what you are reading. Then you will become a Christian. Those who are fearful and cowardly will be outside, and their part will be with all kinds of ungodly and abominable people. Revelation 21:8. “Therefore whoever confesses Me before men, him I will also confess before My Father who is in heaven. But whoever denies Me before men, him I will also deny before My Father who is in heaven.” Matthew 10:32-33. “For with the heart one believes to righteousness, and with the mouth confession is made to salvation.” Romans 10:10. In other words, there is absolutely no question of being saved before we confess Jesus Christ with our mouth! If you believe with your heart and confess with your mouth, then you have become a Christian. This is the very point on which the vast majority go wrong. They say that they have it for themselves. However, this is essentially not true, because they do not have it at all. They say they pray in secret, and of course Jesus Himself recommended that. But if we look into this more carefully, it becomes apparent that this is not true either. How can we know this? Quite simply! Let us read Jesus’ words: “But you, when you pray, go into your room, and when you have shut your door, pray to your Father who is in the secret place; and your Father who sees in secret will reward you openly.” Matthew 6:6. In other words, if there is no outward change, you have not really prayed in the secret place! So it does not work, my dear friend. Now when you enter your secret place, lock your door and pray for great boldness to confess Jesus’ name before people, as the Scriptures clearly command. See how it will go then. God will reward you openly. Then “Nicodemus” will become a Christian in spirit and in truth. Do what the Scriptures say, dear friend! You cannot fightAlmost all talk of battles and wars when concerning a Christian life refers to the inner battle that arises when a sinful thought tempts you. God’s Spirit and the flesh are at odds. When you have decided to only do God’s will and are being led by the Spirit, a conflict between the flesh and the Spirit arises: there is... More on both fronts at the same time; you cannot be both for and against. Choose today whom you want to serve! You will become a Christian the day you take this deliberate step of completely dissociating yourself from everything you know is sin and from all those who want to keep on sinning. Let them know in no uncertain terms that you have gone out from them, and that you are no longer one of them. This must be carried out mercilessly and without exception. Not even the finest and most tender family bonds must be allowed to alter this in any way. The words of Scripture concerning this point are crystal clear and quite strong. “And what communion has light with darkness? … Or what part has a believer with an unbeliever? … Therefore ‘Come out from among them and be separate, says the Lord. And do not touch what is unclean, and I will receive you.’” 2 Corinthians 6:14-17. Of course we must stand at our post in earthlyRefers to everything of this earth, as opposed to heavenly things. Example: Earthly treasures/heavenly treasures. The earthly things pass away (are temporal), but the heavenly things are eternal. (Matthew 6:19-21; Colossians 3:2; 1 John 2:17)... More things; for example, in marriage and in our earthly vocation, etc. (unless our job is directly ungodly); but we must be separate from them in our spirit, so that in our work we do only what is right and pure in God’s eyes. Say farewell to friends and family, or perhaps it is better expressed with “adieu,” which means “to God,” and bid them welcome to follow you! Then you will do yourself and them a service. This article has been translated from Norwegian, and is an excerpt from the pamphlet, “To be a Christian,” published by Skjulte Skatters Forlag in 1936. 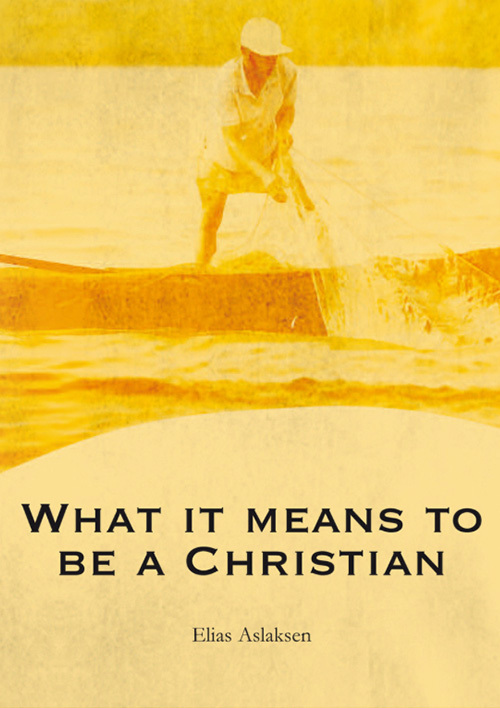 Christian life - beginningWhat is a Christian?